Slow cooked chicken thighs in a sauce made from pomegranate juice and toasted walnuts, and flavored with saffron. Steamed basmati rice flavored with saffron and ghee, and served with barberries, pistachios, and almonds. Flour tortillas cook on the bottom as the rice steams for a crispy treat to pass at the table. Goat’s milk yogurt mixed with cooked spinach and raw garlic. Diced Persian cucumbers and tomatoes mixed with radish or scallions, lemon juice, olive oil, and dried mint. A platter of fresh herbs, scallions, radishes, whole walnuts, and feta topped with olive oil and dried mint. Ground walnuts, almonds, and pistachios along with Medjool dates, formed into decorative shapes, and rolled in cocoa, sesame seeds, or dried coconut. * Food Allergies: This menu includes dairy, tree nuts, and wheat. 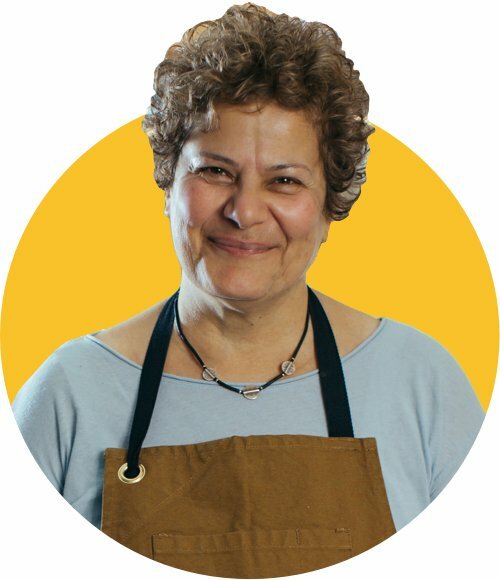 Mab made us feel immediately welcome, from serving us her delicious lentil spinach soup, to sharing details about her childhood and life as a feminist and activist. It was an intimate form of storytelling not many other classes would provide.